Towards the end of 2016, I ran into a past client who I worked with on Headshots. Specifically for his LinkedIn Profile/Resume. He said to me “I think your headshot just got me a job!”. He had been applying to government positions for a while, landed a couple interviews but nothing panned out. About a week after posting his headshot, he landed an interview and a call back for his new career. He had been operating his LinkedIn profile with a “selfie” for quite a while. Which really wasn’t doing him or his career any favors. I was so happy to hear the whole experience worked out well for him. That’s why I want to talk to the rest of you about a profile photo that will bring you success! Now what do you think a professionally photographed image could do for you!? Headshots vary drastically in cost, from $200-$500 and even $1100+ in areas like Toronto and New York City. But, if you are looking for a good job making $100K+ per year, even at the high price of $1100 would be worth you investing in your career. Once you have your headshot on LinkedIn, you can then use it on all your other social platforms for consistency. LinkedIn isn’t the only place your future employer will look at you. They want to know that their company is not at risk by an employee representing them poorly online. If you are running your own business, that same image can now be used for a variety of marketing material such as, business cards, websites, brochures, etc. This small investment has now allowed you to represent yourself as a professional in many places and is even more beneficial for increasing your success and profits. 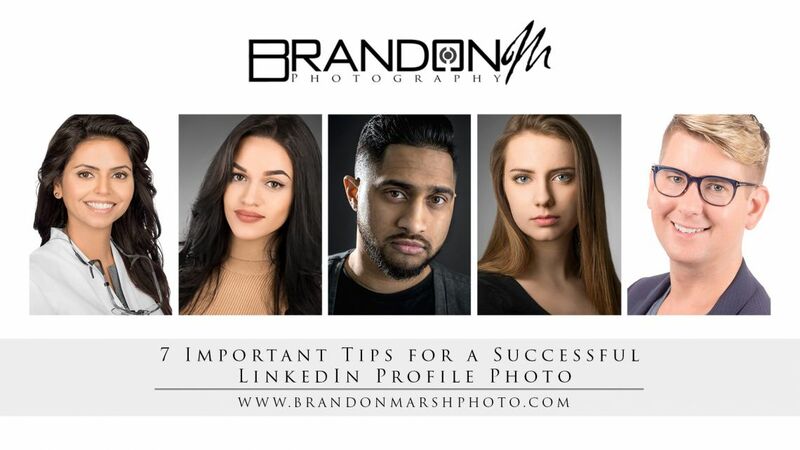 Now that you understand the value of a well executed profile photo, here’s my 7 tips for a LinkedIn profile photo that get’s results! 1. Small space to showcase, make sure you take advantage of it! Think about the amount of space you have and realize that this is some extremely valuable real estate. Profile photos are tiny on a desktop computer and even smaller when viewing on mobile devices. Make sure you have a tight crop, so that your face fills the majority of the frame. This will greatly increase the chances of someone clicking on your profile. Test your crops on different devices to be sure it is displaying correctly on all devices. People these days are pretty good at judging quickly based on appearance. A headshot needs to show your personality and be genuine. A good photographer will know how to help you achieve this. There is also no harm in bringing out certain sides of your personality. People tend to look most for approach-ability, dominance and youthful-attractiveness. Selfies, are always a big “No-No”. They are unprofessional, low quality and consist of poor lighting and color. Overall, this will be a poor representation of you as a professional. You will very quickly be looked at as cheap and lazy and those are extremely poor labels to have when applying for ANY position. Whether you are looking for employment or leads for your own business, you need to portray yourself as approachable and a leader. Employers want to know that when you are dealing with a customer that the customer will be comfortable with you. They will also want to know that they can be confident in you working independently or contributing to a team. Leaders get things done! 6. Lighting Will Change Everything! Lighting is extremely important. Having dramatic lighting might be a bit more artistic and moody. But, it doesn’t always help the viewer focus on you. It actually puts more focus onto texture and wrinkles. Lighting can drastically change how you look. Many real estate agents I have met haven’t updated their headshot in 10 – 20 years… all because they don’t like how they are aging. But, with lighting we can easily decrease the visibility of wrinkles and rough skin, this not only will help you look younger and healthier but, it is still 100% you! No Photoshop required for this part, because the image is still of you, just under more flattering light then office settings or bars. This brings me to my final point, a Good Headshot/Profile photo is a current photo. Photo quality has drastically changed and many of us can tell an old photo from a new one. I know you wish you were still in your early 20’s… embrace who you are and show everyone the real you. I recommend updates with drastic changes to your look like a very different hair cut, or facial hair. An update every 1-2 years is a reasonable guideline. If you are under 20… you are looking at roughly every 6 months. If your LinkedIn profile photo or any other social profile photo does not live up to this, you could be greatly hurting your success. You could be missing out on your dream job or dream client. Remember be who you are and prove you are ready to invest and I promise you, someone will invest in you! Looking to learn more about what makes a successful headshot? Check out our article on “Tips For a Successful Headshot Session” this article goes into more detail of preparation and things to consider when booking your next session.